At NMG we understand that we are community members as well as professionals. We believe that our success comes with the responsibility and privilege of serving our communities (including the global community). We are gratified that the company and its employees have given of their time, talents, and resources to a variety of charitable organizations and endeavors, whether it is an employee’s daughter’s cheer squad, a Boy Scout camp, cancer research fund, or disaster relief effort. Two of NMG’s principals are active supporters of the local academic community: one serving on the steering committee of the University of California, Irvine (UCI) Civil and Environmental Engineering Affiliates and another on the Dean’s Advisory Council at the College of Natural Sciences and Mathematics, California State University, Fullerton. ABC Television’s Extreme Home Makeover—pro bono geotechnical services under the leadership of Shea Communities for a needy family in Boyle Heights. 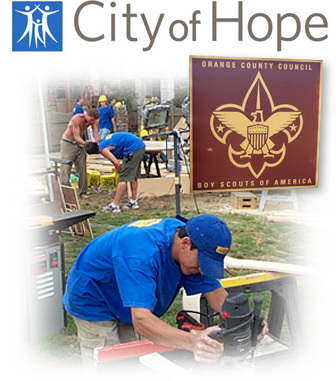 Orange County Outdoor Education Camp (Boy Scouts)—pro bono geotechnical services related to design and construction of the area’s premier outdoor education and scouting center under the leadership of the Irvine Company and Standard Pacific Homes. Disaster relief (Indonesia/Sri Lanka Tsunami, Hurricane Katrina, Sudan/Darfur, California wildfires, Paso Robles Earthquake) with both funds and volunteers through organizations such as Safe Harbor International Relief, In Deed and Truth Ministries, and ASCE and the State’s Office of Emergency Services. City Lights Dream Center—funds, vehicle donations, and volunteers to assist a Hispanic church and non-sectarian youth center’s family and youth programs in central Santa Ana. Irvine Memorial Wall—pro bono geotechnical services for a memorial to military, police and fire personnel who have given the ultimate sacrifice for their country. Families Forward—funds for an organization that helps needy parents with housing, education, job training and placement. Race Across America—Sponsoring building industry colleagues as they participate to raise funds for charitable causes. Corazon—building homes and helping needy families in Mexican border communities with both funds and volunteers. Race for the Cure—supporting the Susan G. Komen Foundation’s fight against breast cancer. Childs-Pace Foundation—an NMG principal serves as a Board member for the non-profit organization that assists needy families with pre-school tuition.